“On June 8th (1899) after Communion, Jesus told me that that evening He would give me a very great grace. I went that same day to Confession, and I told Monsignor (Monsignor Giovanni Volpi, Gemma’s confessor –editor). He told me to be very attentive, so that I could tell him about it afterwards. Evening came, and all of a sudden, earlier than usual, I felt an interior sorrow for my sins, far deeper than I had ever experienced before. In fact, it brought me very, very close to death. After this, all the powers of my soul became recollected. I could think of nothing but my sins, and the offense that they gave to God. My memory recalled all my past sins to mind, and made me see all the torments that Jesus had suffered in order to save me. And my will made me detest them, and promise to be willing to suffer anything in order to expiate them. My mind was flooded with thoughts; thoughts of sorrow, of love, of fear, of hope and of comfort. Following this interior recollection, I was quickly rapt out of my senses, and I found myself before my heavenly Mother (Blessed Virgin Mary –editor). At her right stood my guardian angel, who told me to make an act of contrition. 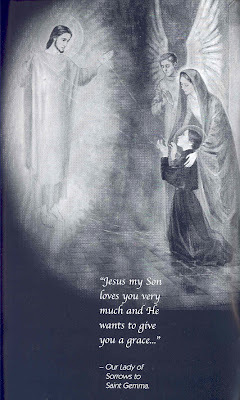 When I had finished it my blessed Mother said to me “Daughter—In the name of Jesus, your sins are forgiven.” Then she added: “Jesus my Son loves you very much, and He wishes to give you a grace. Do you know how to make yourself worthy of it?” In my misery I did not know what to answer. She continued “I will be your Mother. Will you be a true daughter?” She then spread her mantle and covered me with it. At that moment Jesus appeared with all His wounds open, but blood no longer came out of those wounds. Rather, flames of fire issued forth from them and in an instant these flames came to touch my hands, my feet and my heart. I felt as if I would die. I fell to the floor, but my Mother supported me, keeping me covered in her mantle. I had to remain several hours in that position. Finally she kissed me on my forehead, and all vanished, and I found myself kneeling on the floor. But I still felt an intense pain in my hands, feet and heart. I arose to go to bed, and I then noticed that blood was flowing from those parts where I felt pain. I covered them as well as I could, and then with the help of my angel, I was able to go to bed. These sufferings and pains, although they afflicted me, filled me with perfect peace. The next morning I was able to go to Communion only with great difficulty, and I put on a pair of gloves in order to hide my hands. I could hardly stand on my feet, and I thought I would die at any minute. 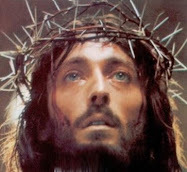 The sufferings continued until 3pm on Friday afternoon, the solemnity of the Sacred Heart of Jesus. 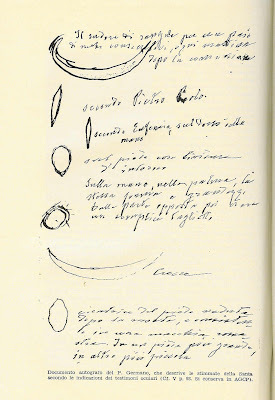 Such is Gemma's simple written account of how she first received that most marvellous of gifts, the sa­cred Stigmata, or marks of our Lord's Five Wounds. The following morning she went as usual to Church to participate at Holy Mass, despite the terrible pains, and she put glo­ves on her hands to cover and hide her wounds. But she was very far from feeling the smallest pride or vainglory because of them, on the contrary she began to wonder whether they were a gift bestowed to all people consecrated by vow to Jesus Crucified. She began also to gently question people in such a way so as to find out whether they had experienced anything of the same kind. 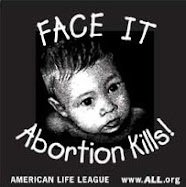 “Aunt, just look at what Jesus has done me!”. Her aunt was completely stunned, and gazed at her in amaze­ment, and knowing Gemma she realized at once that those wounds were due to some supernatural mystery, but she was far from expecting what happened afterwards, na­mely, that for a long time to come Gemma would receive this marvellous and keenly painful favour every week on Thursday night, and that it was to continue until about 3:00pm on Friday afternoons. No preparation whatever preceded the phenomenon, it came upon her always quickly, with a sudden “call” of of her spirit which was then followed by a rapture, during which the wounds appeared in her hands, feet and side, sometimes deeper and more visible than at other limes, but always causing intense suffering, and always disappearing on Friday afternoon or early on Saturday morning. The disappearance of her wounds was as well remarkable: as soon as the ecstasy on Friday was over, the flow of blood from all the wounds ceased, the flesh quickly healed, and on the following day, or at the latest on Sunday, not a trace of those deep gashes remained. Only a whitish mark was left where the wounds had been. This extraordinary grace of the stigmata was repeated on each Thursday evening from 8:00pm until the following Friday afternoon at 3:00pm, the hour in which our Lord Jesus died on the cross. In Gemma's last three years of her life it completely ceased, out of obedience to her spiritual director who forbade it, and Jesus, who always respects obedience above all things, caused the stigmata to cease at the request of her director, however the white marks were distinctly visible upon her body, and especially on her feet, even when she died. And so when Gemma’s spiritual director, Padre Germano Ruoppolo told her to ask God to remove all exterior signs of the passion, she humbly obeyed and prayed that the stigmata and other exterior signs be removed, at least from outward appearance. God seconded the authority of the Priest and answered Gemma’s prayer. For the remainder of her life the exterior signs of the Stigmata were removed, however she often continued to suffer the Stigmata interiorly. During this time she was heard in ecstasy to say “Oh Jesus, I would give you my hands and my feet, but my director has forbidden it. Take my heart then; that at least I can give." Gemma had become Jesus' little victim of love, waiting on His Will for everything. She had learned very well from Him that love is shown by sacrifice, and this knowledge deepened her thirst after suf­fering. And a worthy victim of Love she was! His Wounds upon herself became the treasure of her life and her haven of refuge. And like five precious jewels they adorned her. In union with the wounds of Jesus she found in them all that she wish­ed, and in their blood she bathed and offered all her sufferings and sacrifices, most especially for the conversion of sinners, and for the souls in purgatory; and her message is that we may do likewise, by offering Jesus wounds and blood for ourselves, our loved ones and others. –St Gemma, pray for us! What a beautiful Blog you have! Thank you for writing about this Saint! I've always admired her but I've never really known much about her! God bless and keep you as you are a witness to our faith! I've added you to my Blog list! Thanks for your kind comments. My blog is a labor of love, as I can see by viewing yours that yours is too. I added it to my blog list. My God bless you and yours! I think St. Gemma is a beautiful person that I have been looking for in prayer for a long time. I promise you that if you read the Life of St. Gemma and/or her Autobiography she will quickly capture your heart and admiration. Of this I can assure you. Her heart was all on fire for the love of Jesus and she knew well how to express her love of God. I will be posting lots more from St. Gemma's writings in the next few days so stay tuned! I am glad you are enjoying the website. Why am I so drawn to her? Somehow she seems familiar from my long ago Catholic education. I wouldn't be surprised at all if you have come across St Gemma during your childhood catechism classes. While she is not as popular with the youth as St Therese or St Maria Goretti for example, nevertheless she has always been a model for children since she died at a relatively young age. The Passionist priests and nuns have especially spread devotion to her ands she is often been one of the Saints in childrens catechism books. Hi Glenn! Thank you for creating this wonderful website that honors St. Gemma! I really appreciate this page on how she received the Sacred Stigmata! I like how Jesus, the Blessed Mother and St. Gemma's Guardian Angel all took part in her receiving this mysterious grace! Thank you! The stigmata given by Jesus to St Gemma is so extraordinary, isn't it? Because of the stigmata and the crown of thorns she suffered greatly as a victim soul for the conversion of sinners, and in reparation for sin. 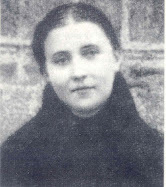 This is a beautiful website on St Gemma Galgani. I have always admired and loved her childlike simplicity but I could never really find enough information about her. This website is obviously a 'labor of love' as you yourself called it. It is quite obvious that is has cost you a lot of labour and effort, not to mention time. I will most certainly continue coming back to it, over and over again! God bless you! 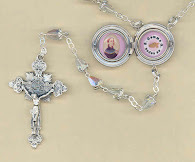 I am really glad to hear that you have a longtime devotion to St Gemma, and that you are enjoying the website. 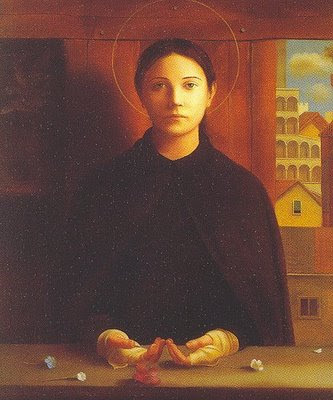 St. Gemma is my confermation saint and this is a beautiful blog. Thank You so much. Hi! i really like her story and having pity for her at the same time.But thanks to her i have learned so much about on how to love Jesus more.....I wish i can know about her life more!! its so nice!! 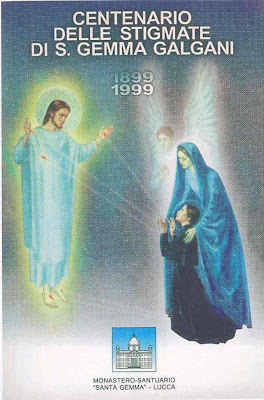 !...GOD BLESS YOU SAINT GEMMA GALGANI AND JESUS!!! !FOR ALL YOU HELP!!!! Thank you so much for teaching us about this beautiful saint! It means so much to me and my family. St. Gemma thank you. Please pray for us. Thanks for your kind comment. I pray that St Gemma may lead you and your family closer to Jesus--St Gemma, pray for us! many Souls to Heaven from Purgatory. Blessed be God, in His Angels and in His Saints! Thank you Margaret---I am really very happy to hear that you are inspired by St Gemma! I pray that she may lead you ever closer to Jesus. Thank you for your kind comments. I am really very happy to hear that you are inspired by the holy life of St Gemma and that you also are enjoying the "Mystics of the Church" and other websites. And I am very happy to hear that you are going to name your daughter "Gemma"! St Gemma is a very special patron Saint to have for sure! My wife and I have a Gemma too---she is 12 years old now. The websites are really a "work of love" so to speak, and I have really been enjoying creating the St Gemma and Mystics websites, along with my other websites over the past few years, and I have learned quite a lot about our Catholic faith in the process, thanks be to God. And I still have many, many more articles that I hope to add to the Mystics and St Gemma websites, God willing. What a wonderful website, nice inspiration, I wonder is there a prayer to the stigmata of the saints? Thank you. Thank you for your wonderful site on St Gemma. I am thinking of converting and am attempting to learn everything I can before I start classes in the autumn. God bless you and yours. Last summer I had a major spine operation. I am now in seventh grade and am preparing for confirmation and have chosen St.Gemma as my saint. Thank you so much I would never have found Gemma if not for this blog.